Just south of the Tien Shan mountains, in northwestern Xinjiang province, a remarkable series of ridges dominates the landscape. The highest hills rise up to 1,200 meters (3,900 feet) above the adjacent basins, and they are decorated with distinctive red, green, and cream-colored sedimentary rock layers. The colors reflect rocks that formed at different times and in different environments. The red layers near the top of the sequence are Devonian sandstones formed by ancient rivers. The green layers are Silurian sandstones formed in a moderately-deep ocean. The cream-colored layers are Cambrian-Ordovician limestone formed in a shallow ocean. The Operational Land Imager (OLI) on the Landsat 8 satellite captured this view of the Keping Shan thrust belt on July 30, 2013. The ridges are oriented northeast to southwest and stretch from Kashgar to Aksu, China. Narrow basins separate the ridges, and shallow lakes are visible at some of the lowest points. 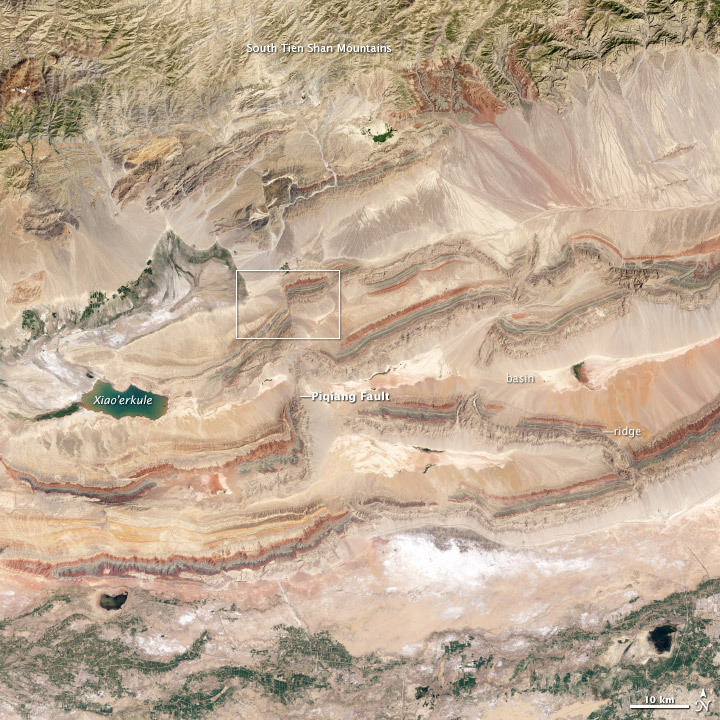 Lighter-colored areas are sediments left behind by dried-up lakes. While most of the region is arid and barren, a green strip of vegetation traces the Kashgar River in the lower part of the lower image. The foothills of the Tien Shan mountains are visible near the top of the image. This part of Xinjiang province has a rich and varied geologic history. About 300 million years ago, the Tien Shan mountains began forming when the Tarim Block—a mass of land that was once part of Australia—collided with Eurasia. During the Mesozoic Era (252 to 66 million years ago), a series of island arcs (curved chains of volcanic islands) continued to smash into Eurasia, further building the mountain range. About 80 million years ago, the Indian subcontinent started colliding as well, triggering a whole new phase of mountain building. When land masses collide, the pressure can create what geologists call “fold and thrust belts.” Slabs of sedimentary rock that were laid down horizontally can be squeezed into wavy anticlines and synclines. Sometimes the rock layers break completely, and older layers of rock pile up on top of younger layers. This type of break, known as a thrust fault, formed the series of ridges seen in the images above. Another type of fault is visible as well. In two areas, the ridges are noticeably offset by a strike-slip or “tear” fault. 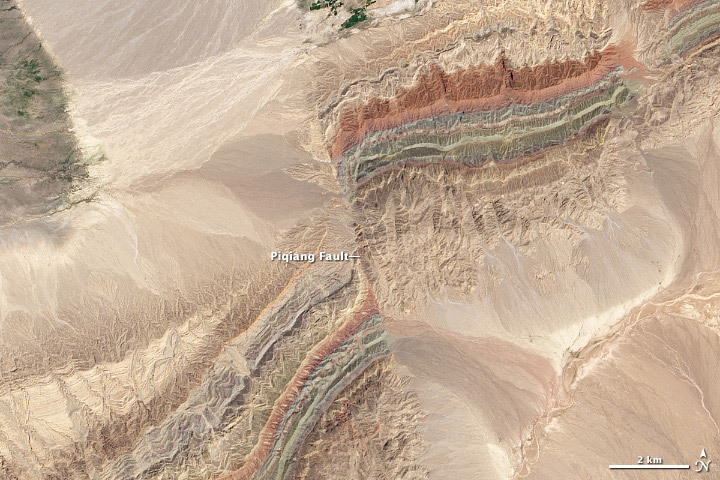 The top image shows Piqiang Fault, a northwest trending strike-slip fault that runs roughly perpendicular to the thrust faults for more than 70 kilometers (40 miles). The colored sedimentary rock layers are offset by about 3 kilometers (2 miles) in this area. Turner, S. (2011, January 4) Structural Evolution of the Piqiang Fault Zone, NW Tarim Basin, China. Journal of Asian Earth Sciences, 1, (4) 394-402. Accessed January 15, 2014. Geomorphology from Space (2013, January 9) Kashgar Ku-Che Fold Belt, Tian Shan. Accessed January 15, 2014. NASA Earth Observatory images by Robert Simmon and Jesse Allen, using Landsat data from the USGS Earth Explorer. Caption by Adam Voiland.